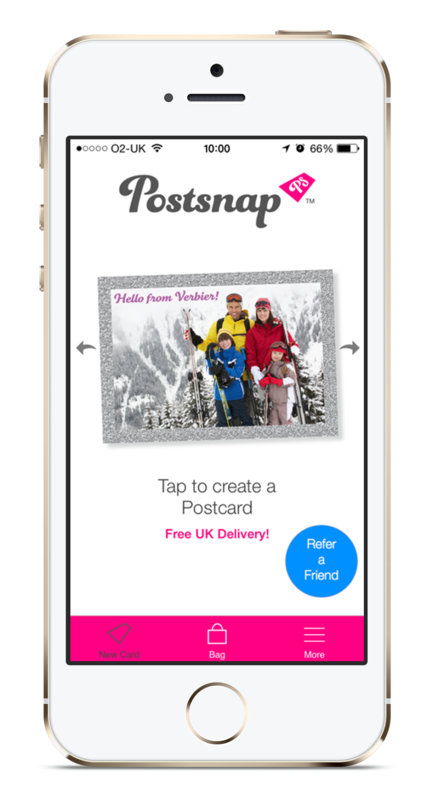 Charlotte in England: Postsnap App Review & FREE credit! When flicking through my latest edition of May's Glamour Magazine I spotted "The Summer Tech Top 10"; one was promoting Postsnap. 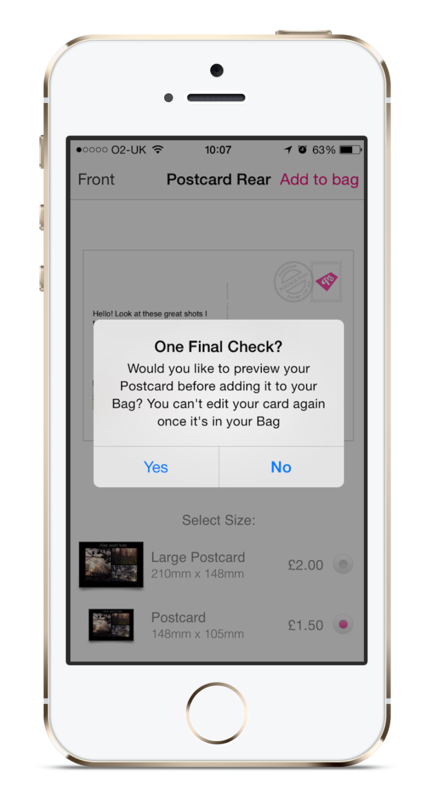 An app based postcard and greeting card service. 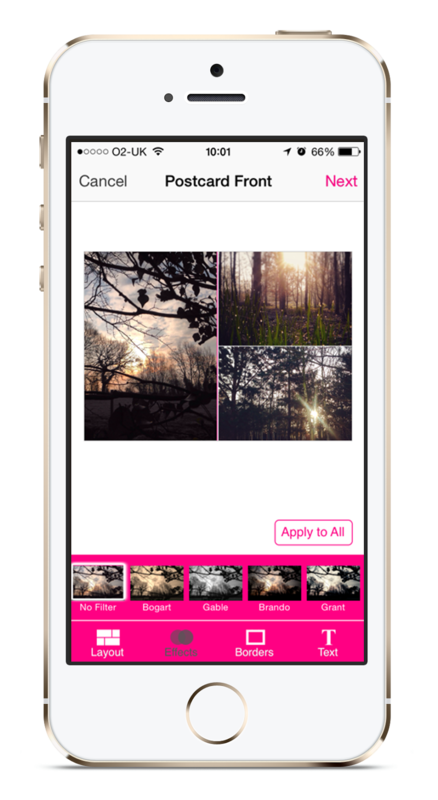 What's best is how you can choose your own special photographs straight off your phone making your postcard unique. 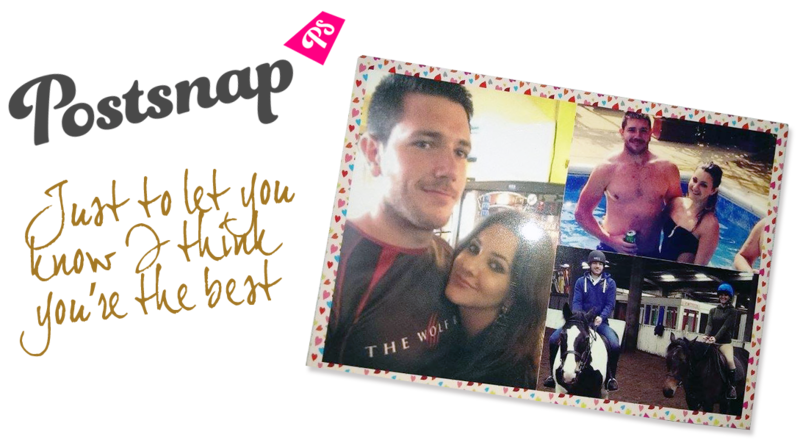 They have collage options so you can add up to 12 photos to the front of your card plus you can add colour or graphic borders. It's super quick and easy so you can do it on the move (if of course, you have internet access - beware of those nasty internet charges). If you want to add a text overlay, boom, a quick tap of the "text" tab and you can it instantly. As the postcards are printed in England it means your cards are unlikely to get lost on the way from your holiday destination. You can also add your own message on the back of the card. I think adding an immitation handwritten script type font would be a great addition to give the card a personal touch. The card I made is at the top of this page! My boyfriend was really chuffed with it, it was a surprise and really made him smile. 2 - Download the app. 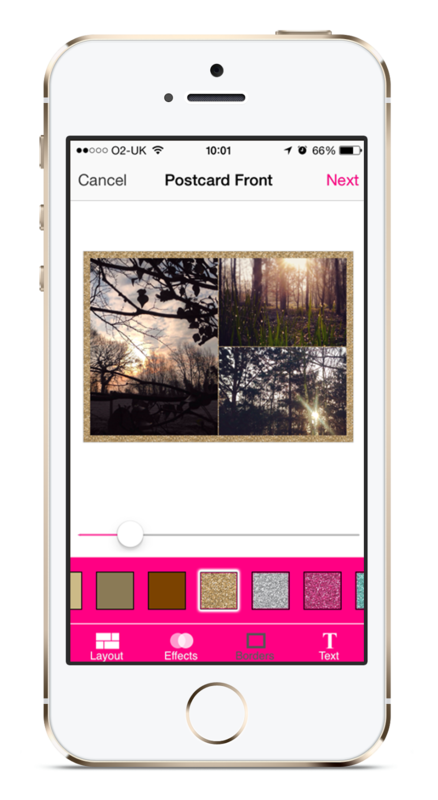 Search for "Postsnap"
3 - Tap "New Card" and scroll to find your desired card; greeting, postcard or announcement card. 4 - This will open a new screen. 5 - Select a collage option - there's lots to choose from, from 1 photo to 12. 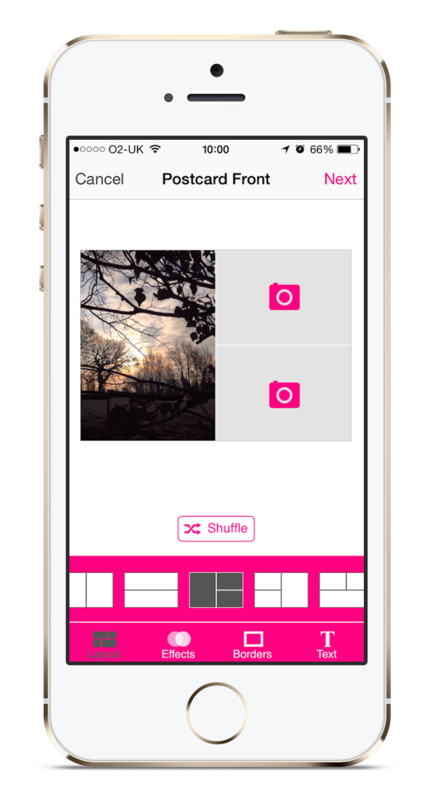 6 - To add your own images just tap the camera icon within the box. You can take an instant photo, choose existing photo, choose a Facebook photo or even an Instagram photo. How good is that? 7 - Zoom or adjust your chosen photos to fit. You can shuffle the photos around into a random order by hitting "shuffle". 8 - Want to add a filter? There are currently 10 to choose from. Tap Effects to add one. You can adjust the saturation of the filter and also apply it to just one collage section. Apply all to get the same effect throughout. 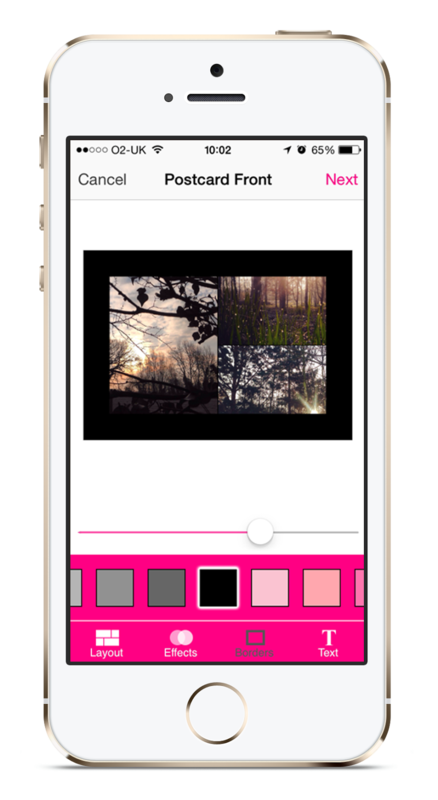 9 - If you want to add a colour border or a graphic border, hit "Borders". 28 graphic, 6 faux glitter and lots of solid colour borders. You can change the depth of the border by pulling the scroller at the bottom. 10 - Next is the "text" option, if you don't need any text you can skip this section. They have a serif, sans serif and script fonts to choose from. You can increase the size of the font by pulling the arrows bottom right. I think text can be hard to read layed over the top of an image sometimes so make sure you can make heads or tails of it my choosing a suitable colour. 11 - Done? Great, tap next (top right). 12 - Lets look at the back of the card. Here you can add a personal message, a signature and your recipients address. You can add up to 11 lines of text here which is great if you like writing longer messages telling your family or friends what you are getting up to! 13 - The signature section is great. 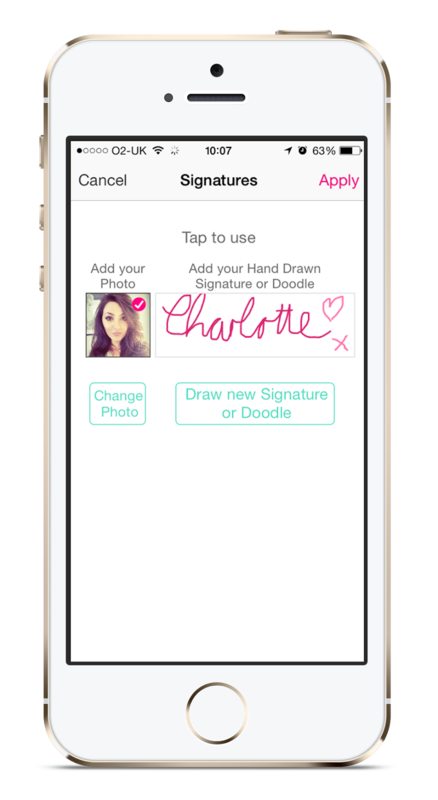 You can add your own profile photo and you can write a hand drawn signature or doodle. It may take a few attempts to get your signature right! 14 - Add the address. You can select addresses from your iPhone contacts (if you have it inputted, if not you will have to add this manually so make sure you have their address handy). 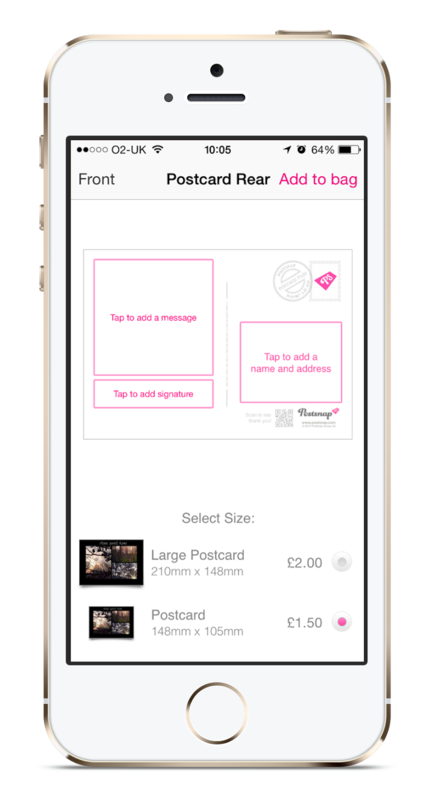 15 - At the bottom of this page select what size card you want to send, large postcard, standard postcard. 16 - Once you add it to the bag you will be prompted to do a final check of your postcard. You can't edit it again once it's in the bag so make sure you're happy with it before going forward. Postsnap asks you if you want a duplicate of the card so you can send exactly the same card to another recipient. You can customize it further before you send it off. 17 - HINT: If you attempted a text option but thought against it, make sure you click the little x (top left of the text box) so the text doesn't get printed on your card. 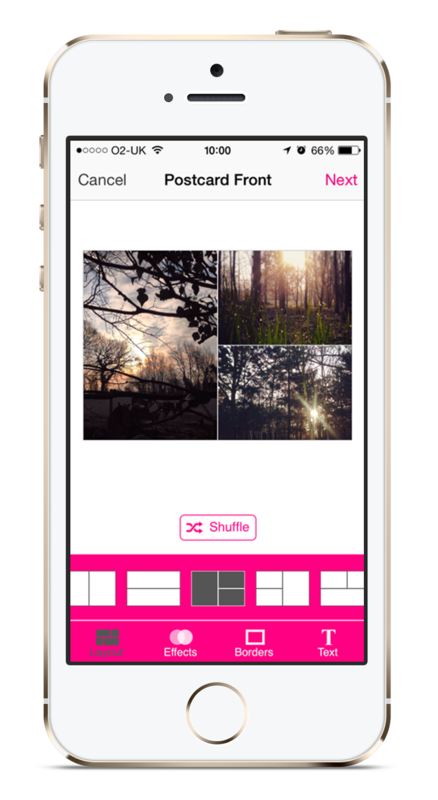 If you want to change the photographs, go back to the Layout tab and tap the photo you want to change. 18 - All checked and happy? Then lets Add to bag. 19 - There is your card in the bag. You can check the options are correct and also the address. UK postage is included in the price which is excellent. At the bottom you can add a Promotion code. If you enter my unique referral code C3A1A3 you will get £3.00 worth of free credit for you to use! 20 - Click Checkout (top right) and jobs a gooden. The greeting card options are lovely. There are a lot of templates to choose from and they have been nicely designed. The pre designed templates have a few colour options to choose from and you can add your own photographs like the postcard option. You can choose from; Happy Birthday, Thank you, New home and Birth of a baby. Again, you can change the text inside. I found the App really user friendly and I got to grips with it straight away. 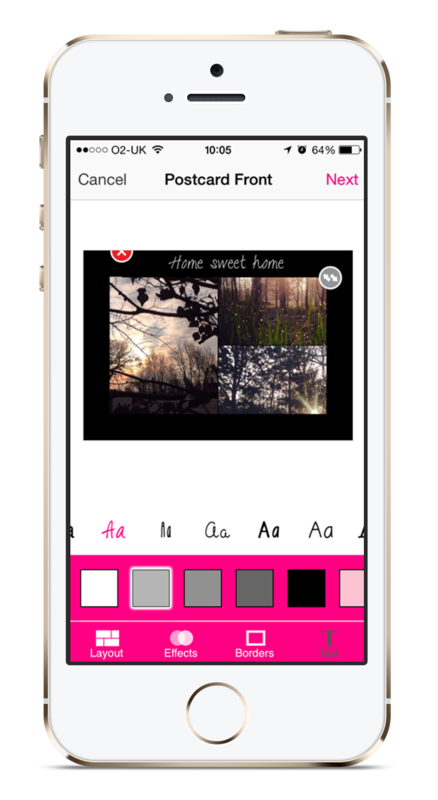 I liked the freedom you have within the App itself with the use of photo effects, collage options, borders and adding a text option. I loved the fact you could add your own written signature or doodle at the bottom on the back of the card, even if it did take a few attempts to be able to read my writing! This made it even more unique. The website is gorgeous. It's simple and clean and really easy to navigate and find out what you need to know. Maybe they will branch out and offer a postcard abd greeting card service online as well as app based. I think this would benefit a lot of other users as not everyone has an iPhone. The greeting card option would be really beneficial by offering this online because people could quickly hop on to the site to send a Birthday card. The customer service is fabulous. I was really impressed with the way Becky was straight on the case with an issue I had where my order could not be finalised at the checkout. These guys are also on Twitter. From when it was printed and posted it arrived the next day. So, it was posted on the Tuesday and arrived on the Wednesday. I was very impressed with the speed! There are a few things I would add from a designer point of view; a cool option would be to add a place and date stamp to the rear by tracking your GPS, i.e - Sent from Toronto, Canada, 01.01.2015 with a little map within a circle. Adding an outline stroke to the text to make it legible over the photographs and finally adding a few text options (inc nice handwritten script font) for the actual message text on the rear of the card. But overall, it was a pleasure to create! Want to try Postsnap for FREE? If you enter my unique referral code C3A1A3 you will get £3 worth of free credit for you to use for yourself. I don't have a bad word to say about Postsnap! Have you tried Postsnap? How did you get on?